It was pouring when I left Rameshwaram. Almost every brick in this spiritual town tells the story of Ramayana . The temples echo episodes from the epic while every well lends a sacred touch. Even nature pays homage to Rama as the epic has been set in this mystical landscape, be it the forests or the seas. 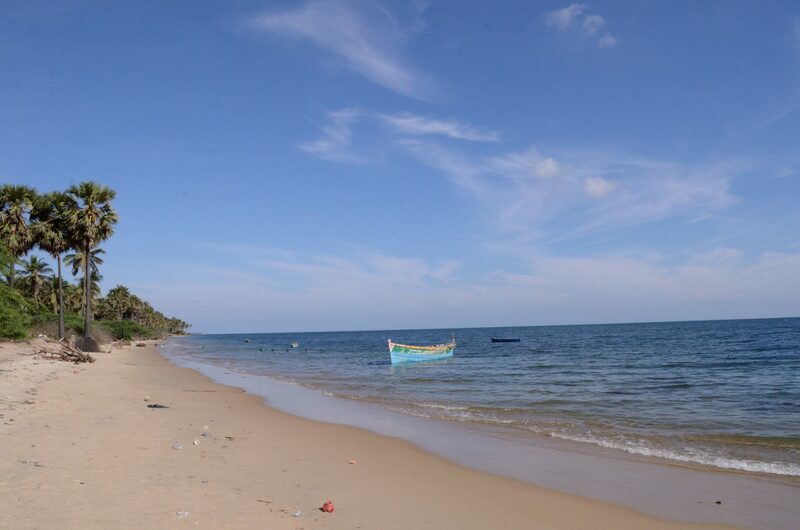 Most people who visit Dhanushkodi go beyond the ruins towards the Land’s End to see the oceans where Rama and his army built the bridge to connect to Srilanka. 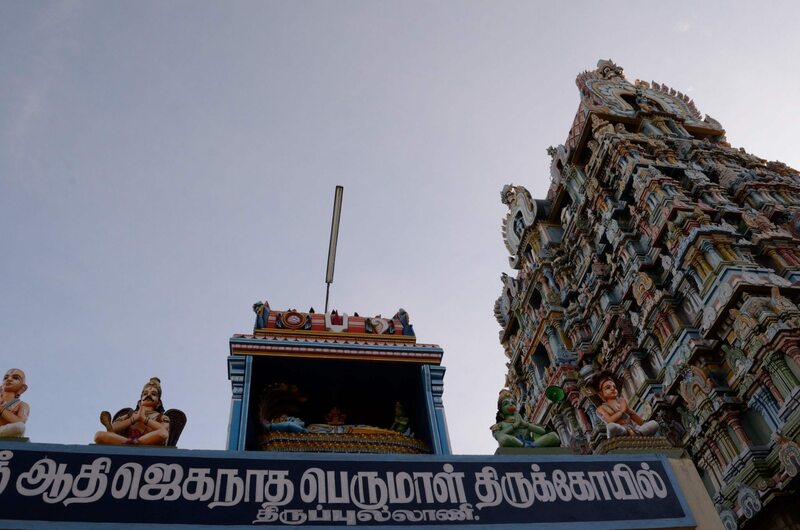 However there is a temple located closer to Ramanathapuram town, which resonates with more stories from the legendary epic. Even Ramar Sethu or the bridge connecting to Lanka was apparently built from here. I am referring to the Adi Jaganatha Perumal temple in Thirupullani which is considered to be one of the 108 Divya Desams dedicated to Vishnu. Here Rama is seen in a reclining posture and is referred to as Dharbasayanar Ramar. The rains had just abated when I entered this ancient temple. It was closed when I entered but there was a group of devotees waiting at the entrance. The sea breeze brought the temperature down as I looked around. Historically the structure of the temple is dated to the Medieval Chola Period although various dynasties have modified it over a period of time. However the legends take you to the days of the Ramayana. A priest who opened the shrine told me that this temple was at the very centre of the epic as it was connected to Rama’s birth. King Dasaratha had apparently come here with his queens to worship the deity Adi Jaganatha Perumal . Legends say that this was where he was given a bowl of payasam or kheer and was asked to give them to his wives. Even today childless couples pray to the deity here and the custom includes installing a statue of the snake god here. Devotees believe that the original idol of the Naga or the snake deity was installed by King Dasaratha himself. The reference however to Dharbasayanar Ramar comes much later in the epic when he arrived here looking for a way to reach Srilanka. Rama apparently prayed to the God of Sea by lying on a bed of grass and meditating on it asking the Lord of the Seas to show the army a path . The bridge was eventually built from here and Rama returned to pay his respects after defeating Ravana in the battle. While I headed to the sea shore, to get a glimpse of the legendary bridge , I also learnt that Vibeeshana brother of Ravana had surrendered himself to Rama and had joined the army at the behest of Hanuman. Although the temple was the setting for so many episodes, it was the Sethu Samudram that beckoned me. A small shrine was built on the sea shore. An old caretaker told me that fishermen usually ferry people inside the sea to show the remains of the bridge under water. However it had been discontinued recently due to the cyclones and the heavy rains. 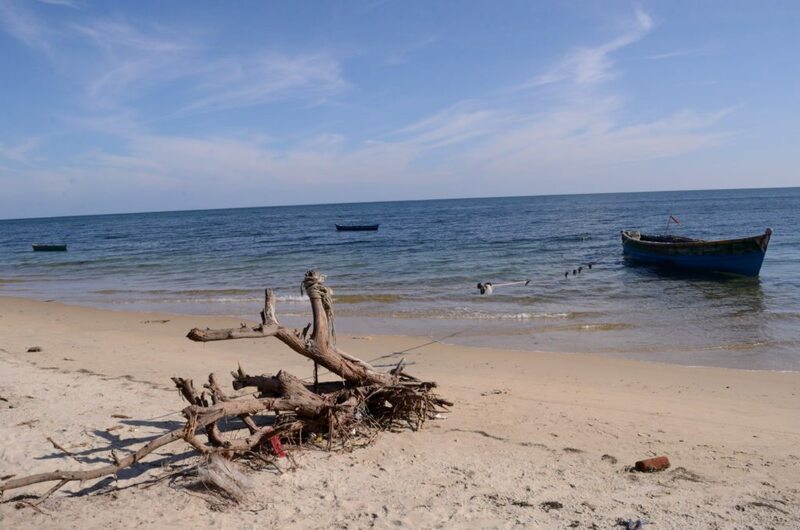 I could only see the pristine blue waters and white sands on the beach as I went for a long walk on the sea shore until the rains lashed again. As I left , I realized I had been walking in Rama’s footsteps along the coast. For more beautiful skies around the world, visit Skywatch. Beautiful shots of the beach and that ornate temple. Lovely shots and a nice temple. Thanks for sharing info about this little known temple. Fascinating history with your beautiful photos Lakshmi.